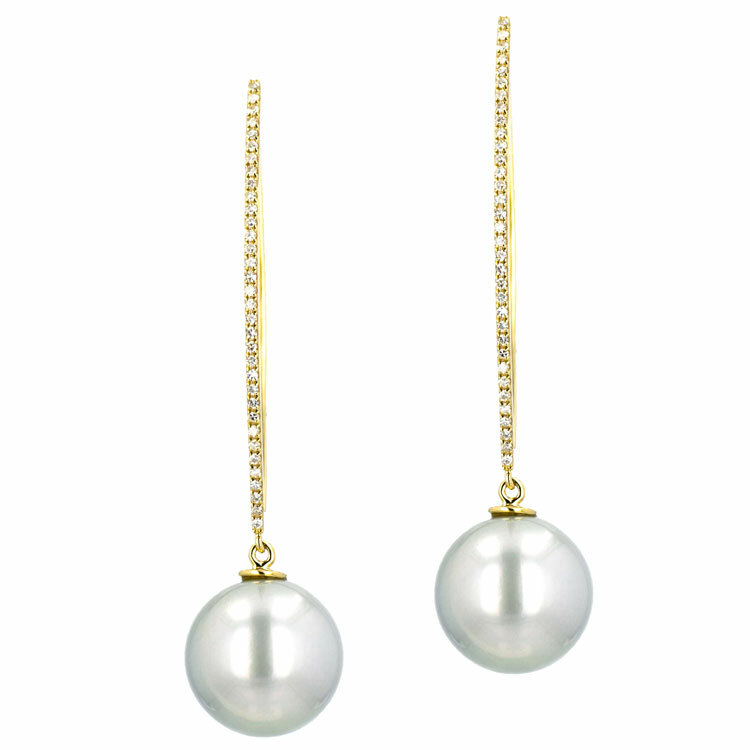 When it comes to the final touch to an impeccable outfit, our collection of Hinerava Pearl earrings is here for you. 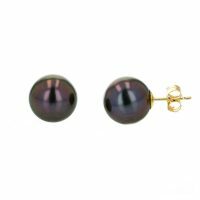 Tahitian pearl stud earrings complement a classic dress or pencil skirt, while glamorous dangling earrings make the perfect statement for a night in the city. 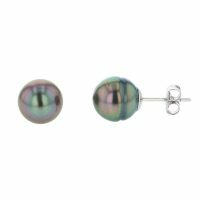 From pearl hoops, studs, dangling, or novelty whimsical earrings, Hinerava offers pearl earrings for every mood and occasion. 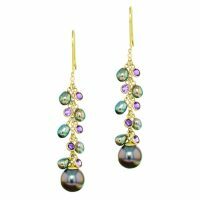 Our collection of elegant designs incorporates perfectly matched Tahitian Pearls in a dizzying array of colors. If you do not see the pair of pearl earrings that you are looking for, please contact us to assist you. 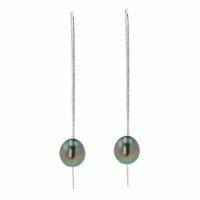 Hinerava’s Element Collection features your every day earrings: sterling silver brushed links and beautiful 9 mm Tahitian pearls. Available in vermeil. Length: 6 cm. 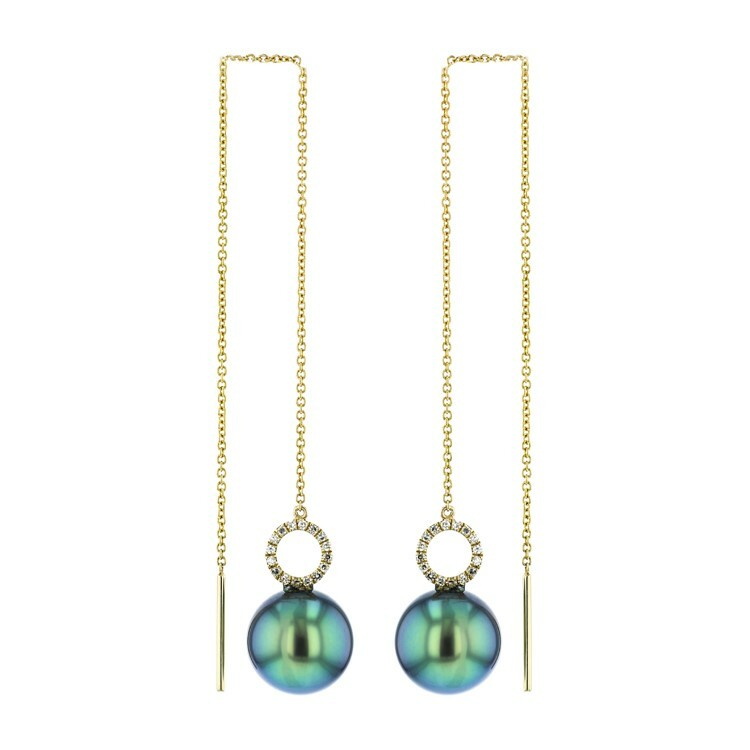 Hinerava’s Element Collection features your every day earrings: vermeil brushed links and beautiful 9 mm Tahitian pearls. Available in sterling silver. Length: 6 cm. Hinerava’s Poésie Collection presents an exquisite 1.1 carat white topaz gemstone earring set in 18K white gold with 4 beautiful Tahitian keshi and matching Tahitian pearls. Hinerava’s Elements Collection features earrings inspired by coral branches. Each branch is enhanced by glittering white topaz gems on which is suspended a glowing Tahitian pearl. 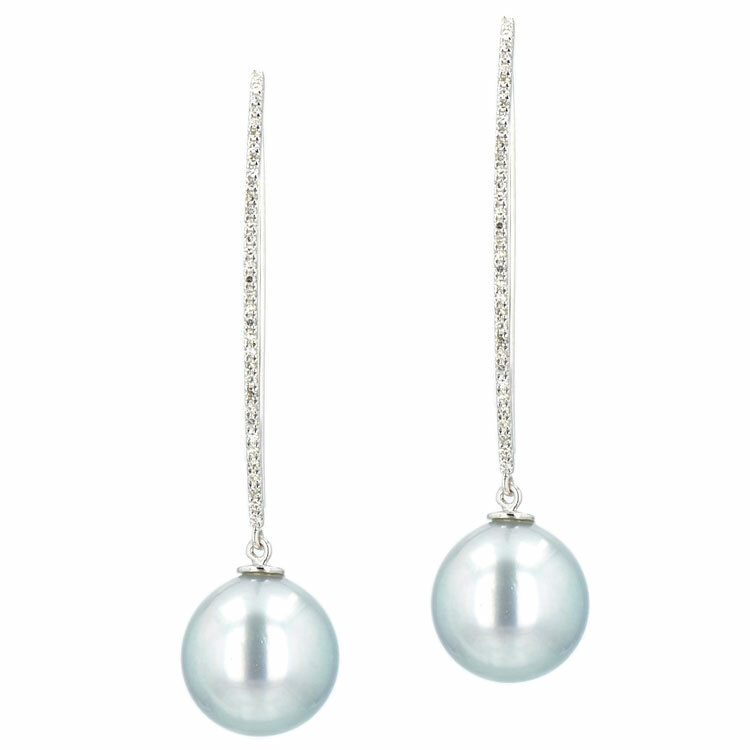 The earrings measure 2 inches long including the pearl and are made of sterling silver, coated with rhodium (tarnish resistant). 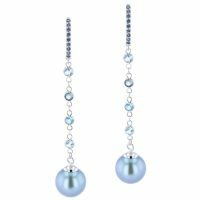 Hinerava's Poésie Collection features romantic 18k white gold earrings, composed of a cluster of rare and exquisite blue keshis with perfectly matched Tahitian blue pearls. White sapphires complement the design, 1.2 carats. Hinerava’s Signature Collection features diamond hoop & pearl earrings, 0.53 carats, set in 14K white gold. Impeccably matched Tahitian pearls dangle from diamond hoops. 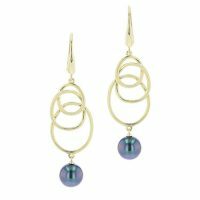 These versatile earrings allow the huggie to be worn with or without the pearl hoop, resulting in two styles of earrings in one. Length: 5.5 cm. 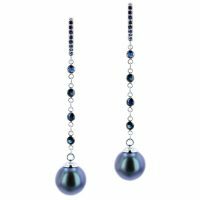 Hinerava's Poésie Collection presents its simply sophisticated earrings: black diamonds, total 0.945 carats, set in rhodium coated 18K gold and finished with perfectly matching Tahitian pearls. Length: 5 cm. 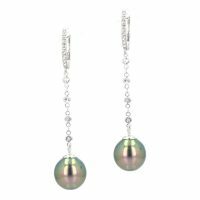 "Hinerava's Poésie Collection presents its simply sophisticated White Sapphire Dangle earrings: White Sapphire, total 0.5 carats, set in 18K white gold and finished with perfectly matching Tahitian pearls. 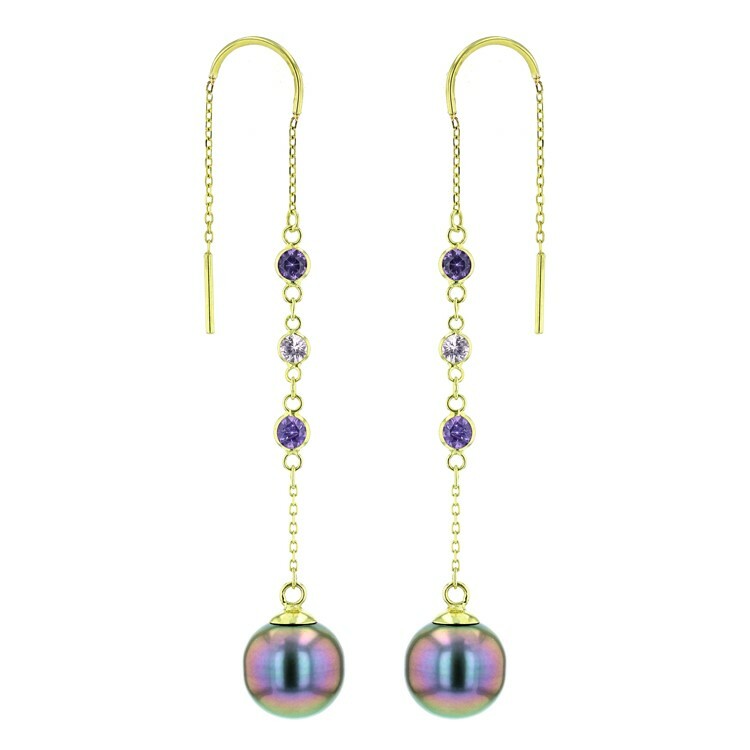 Length : 5 cm "
"Hinerava's Poésie Collection features a Pink & Purple Sapphire Threader Earrings, 0.81 carats, set in 18K white gold and finished with a pair of exceptional Tahitian pearls. 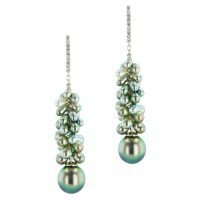 Length: 8.3 cm "
Hinerava’s Poésie Collection presents a striking pair of earrings composed of 5.8 carats of white sapphire emerald cut gems and a pair of 12mm silver Tahitian pearls. 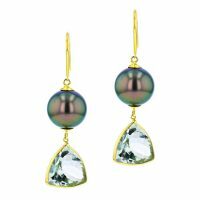 Hinerava’s Poésie Collection features sparkly geode earrings, 3.68 carats, haloed with diamonds, 0.20 carats, and highlighted with 9mm Tahitian pearls set in 14K white gold. Lenght: 5 cm. 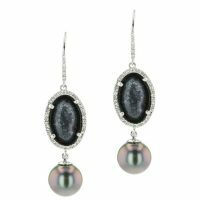 Hinerava’s Poésie Collection features sparkly geode earrings, 6.87 carats, haloed with diamonds, 0.24 carats, and highlighted with 9mm Tahitian pearls set in 14K white gold. Lenght: 5 cm. 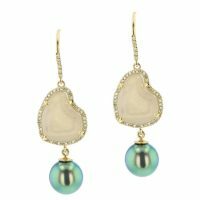 Hinerava’s Poésie Collection features sparkly geode earrings, 17.11 carats, haloed with diamonds, 0.34 carats, and highlighted with 9mm Tahitian pearls set in 14K yellow gold. Lenght: 5 cm. 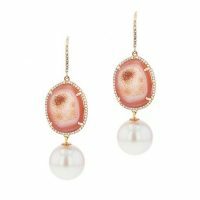 Hinerava’s Poésie Collection features majestic Tahitian pearl earrings in 14K rose gold with unique pink geode centers, 14.52 carats, and haloed by diamonds, 0.25 carats. Hinerava’s Poésie Collection features sparkly geode earrings, 6.51 carats, haloed with diamonds, 0.23 carats, and highlighted with 9mm Tahitian pearls set in 14K white gold. Lenght: 5 cm. 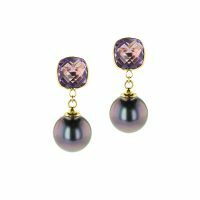 Hinerava's Poésie Collection features majestic Tahitian pearl earrings with unique geode centers, 3.85 carats, haloed with diamonds hanging from diamond-studded leverbacks, 0.2 carats, and set in 14K Yellow gold. 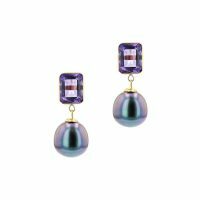 Hinerava’s Poésie Collection features sparkly geode earrings, 11.96 carats, haloed with diamonds, 0.03 carats, and highlighted with 9mm Tahitian pearls set in 14K white gold. Lenght: 5 cm. 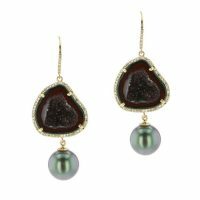 Hinerava’s Poésie Collection features sparkly geode earrings, 8.64 carats, haloed with diamonds, 0.26 carats, and highlighted with 9mm Tahitian pearls set in 14K yellow gold. Lenght: 5 cm. 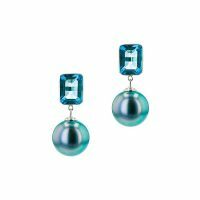 Hinerava’s Poésie Collection presents an exquisite 2.23 carat London blue topaz gemstone earrings set in 14K white gold and diamonds, 0.12 carats, with matching beautiful Tahitian pearls. Length : 2cm. 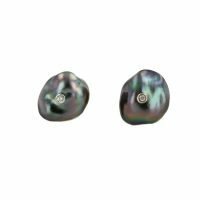 Tahitian pearl stud earrings are classic and timeless, a must for every women's jewelry collection. 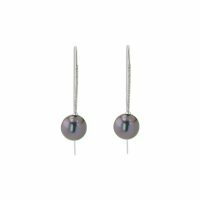 Hinerava's Elements stud earrings features perfectly matched 8 mm Tahitian pearls, and mounted on silver. 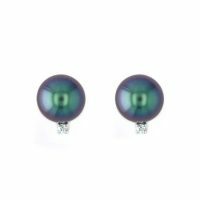 Hinerava's Signature Collection features striking white diamond stud earrings, 0.055 total carats, set in 18K white gold with exceptional Tahitian pearls. 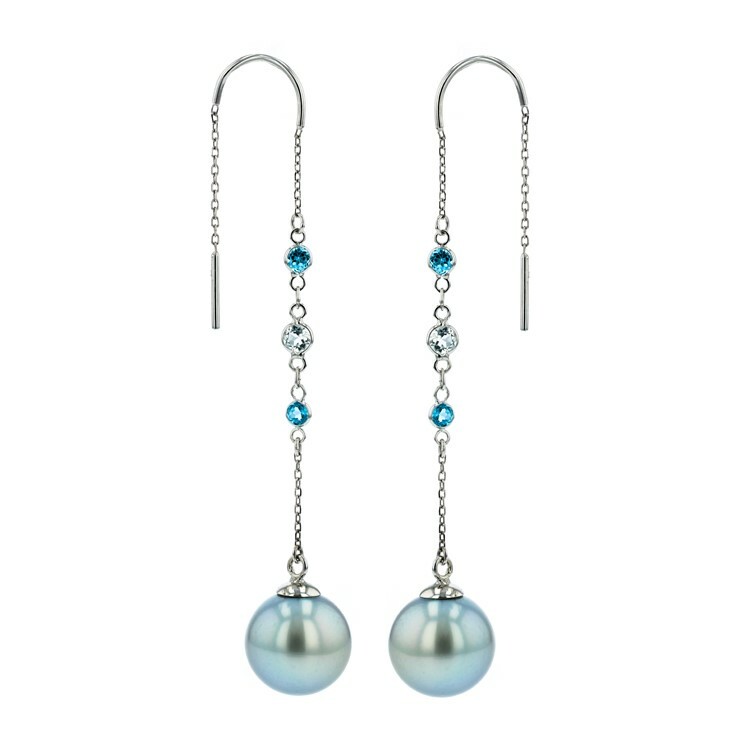 Hinerava’s Element Collection features Tahitian keshi stud earrings, set in sterling silver. 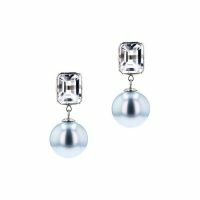 Hinerava’s Signature Diamond Halo Pearl earrings feature an elegant pair of 8mm Tahitian pearls, haloed by white diamonds, 0.24 carats, set in 14k white gold. 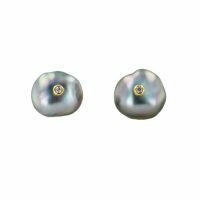 Tahitian pearl stud earrings are classic and timeless, a must for every women's jewelry collection. 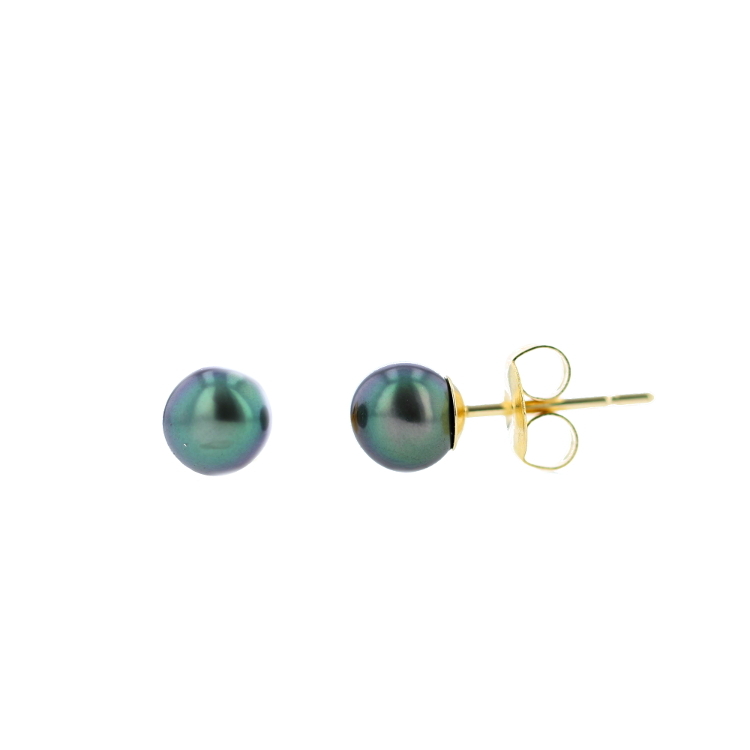 Hinerava's Signature stud earrings features perfectly matched 9 mm Tahitian pearls, and mounted on 18K yellow gold. Hinerava’s Signature Collection features a sparkling diamond set in keshi stud earrings, 0.024 carats, 18k yellow gold. Hinerava’s Signature Collection features a sparkling diamond set in keshi stud earrings, 0.024 carats, 18k white gold. 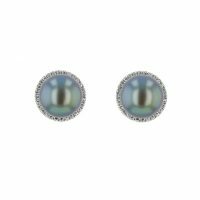 Tahitian keshi stud earrings are elegant and timeless, a must for every women's jewelry collection. Hinerava's Signature stud earrings feature perfectly matched 3 to 6 mm Tahitian keshi, mounted on 18K yellow gold. Hinerava’s Signature Collection features striking white diamond long bar earrings, 0.26 carats, set in 14k white gold with exceptional Tahitian pearls. Length: 6.5 cm. Hinerava’s Signature Collection features striking white diamond medium bar earrings, 0.11 carats, set in 14k white gold with exceptional Tahitian pearls. Length: 3.5 cm.